For more than 30 years, FORTA® reinforcing fibers have been used in elevated slab concrete applications with much success. Designers and specifiers have discovered that cost savings are dramatic when FORTA’s three-dimensional fibers are used as an alternative to wire mesh reinforcement. 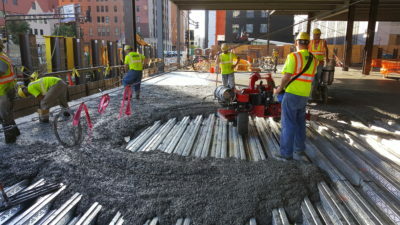 The handling of the wire mesh, the time necessary to place it, and additional provisions required during concrete placement to ensure the safety of the workers and equipment, all combine to justify the use of FORTA’s family of fibers. One characteristic important when considering fiber reinforcement in elevated slab applications is an appropriate fire rating (U/L Certification). FORTA’s monofilament fibers and fibrillated fibers are approved at a dosage rate of 1.5 pounds per cubic yard for use in D700 and D800 series decks as an alternative or in addition to welded wire fabric. FORTA-FERRO® macro-synthetic fibers are approved for usage in all D700, D800 and D900 series decks as an alternative to welded wire fabric at a dosage rate up to 5.0 pounds per cubic yard.